Friday’s session ended relatively on better-than-expected note as the NIFTY tested its lifetime high levels and ended at a new Closing high putting on gains of 52.70 points or 0.50%. Tuesday’s session is likely to open on a quiet note. Though Markets in general are likely to continue to show positive intent, the benchmark Index NIFTY50 still awaits a clear and clean break out on the Charts. It is likely that the NIFTY attempts fresh highs again but in any case the levels of 10490 will continue to remain important levels to watch out for. It would be important for the Markets to remain above these levels to continue to inch higher. 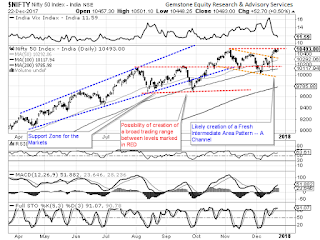 The levels of 10535 and 10580 will play out as immediate resistance area for the Markets. Supports come in at 10410 and 10375 zones. The Relative Strength Index – RSI on the Daily Chart is 63.6098 and it has marked its highest value in last 14-days which is bullish. Daily MACD continue to remain bullish while trading above its signal line. No significant formations were seen on Candles. 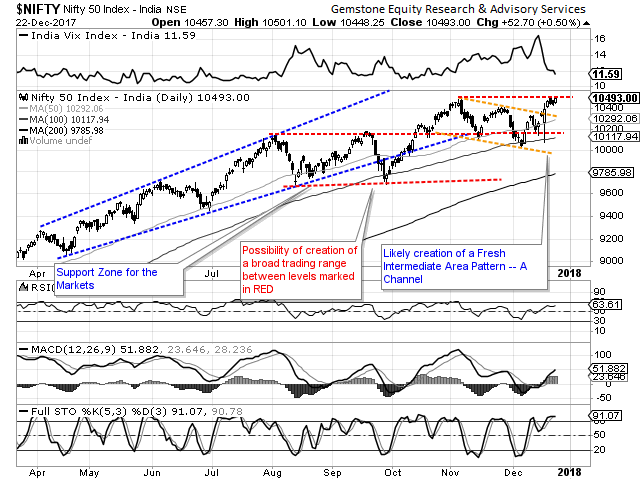 The pattern analysis show positive intent of the Markets on the Daily Charts. However, despite ending at fresh Closing highs, the levels of 10490 continue to pose major resistance and the Markets are seen resisting to those levels. For any sustainable up move to occur, the levels of 10490 need to be breached on the upside in a meaningful way. The lead indicators show some tiredness and this needs to be approached cautiously. All and all, the Market breadth in the frontline Indices also remain slightly fractured. There are all chances that the Markets continue to see select out-performance from individual stocks and besides this, remain in overall consolidation. In the present setup, while we still await a clean break out, some selling pressure from higher levels cannot be ruled out. The Nifty PCR remains at elevated levels. We recommend keeping exposures at modest levels and focus on protecting profits at higher levels until a clear break out is achieved.